The value of a soul is the blood of Jesus Christ. You’re a co-labourer together with God, and God is about building lives; He’s about saving souls. 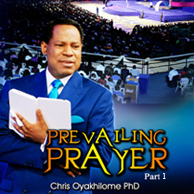 Learn from this timely teaching by Pastor Chris how to produce the harvest of souls that you desire in your cell or church through prevailing prayer.